The rose colored vestments for Lætáre Sunday tell us that Lent is roughly half over. We are urged to rejoice today, but to rededicate ourselves to the observance of Lent on the morrow. We’ve been talking about the theological virtues for the past two weeks. Faith, Hope, and Charity. I mentioned that these virtues are called “theological” because through them we move into closer and closer union with God, and eventually become suitable to dwell in His presence forever in eternity. Like any of the virtues, they give us a certain power, or inclination towards the good—with the theological virtues, the good is God Himself. The third of these virtues is called “charity”—but (for the moment) we must distinguish it from the modern use of that word. Only a few weeks ago we read the words of Saint Paul: “And if I distribute all my goods to feed the poor, and if I deliver my body to be burned, yet do not have charity, it profits me nothing.” In modern English, charity means giving to the poor and otherwise seeing to it that their needs are met. In this modern use, one’s motives may be very altruistic, perhaps even motivated by the love of God and our Lord’s admonition that we care for the needy as we would care for Him—but on the other hand, modern charity for the poor might come from base motives like seeking power through bureaucracy, or concern for one’s property values. When we use the word “Charity” as the name of the theological virtue, we are speaking of the pure and disinterested love of God. Like Faith and Hope, Charity is an infused virtue—one that we receive at Baptism, and one that can be nourished through the various sources of sanctifying grace. It is a work of God in our souls. It is a virtue of the will rather than of the intellect; it is not an emotional thing that grows by being stirred up by hand waving, back slapping, the away of the crowd or any other such thing. If we can do anything on our own to increase Charity it can only be through purification of the will—that is to say that we can put aside all of the conflicting desires which might keep us from desiring God. That is one of the reasons for making a good Lent—to learn on a first hand basis that we can do without many of the distractions of the world—or at least that we can do with less of them. All three of the theological virtues can be said to be “interactive.” That is to say that one without the other two is difficult or impossible to imagine. Faith, or Belief in what God has revealed, would be rather meaningless without the Love of God and the Hope of happiness with Him. Charity, or Love of God, would be equally meaningless without at least some Belief in God, and would be the worst imaginable frustration if there was no Hope of happiness with Him. Now, occasionally, you will hear someone say that God is too great or too distant or too hidden for a mere human being to love. I would suggest that there are three remedies for anyone who has difficulty in loving God. First, remember that Charity is not an emotional thing. If we seek an emotional attachment such as we might have with a husband or a wife, we are seeking the wrong thing and will never find it. Second, do try to purify the will of other attachments which may compete with the love of God. That does not mean that everyone must live the life of a monk or a nun, shut up in a monastery, doing perpetual penance—although there may be room for some of this in everyone’s life, at least part of the time. But, what it does mean is an ordering of priorities. The legitimate pleasures of the world are just that—they are legitimate, they are good when used with appropriate moderation. But they are more immediate in drawing our attention than God is; we must not let them crowd God out of our lives. There is such a thing as too much entertainment, too much celebration, and too much pampering of ourselves with attractive clothing and accessories. There are only so many hours in the day, and often these excesses simply squeeze God out of that day. There has to be time for prayer, spiritual reading, and meditation—one ought not be a complete stranger to Mass during the week, to frequent Communion, or to a few moments in the confessional now and then. It is very difficult to love someone whom you do not know—if you want to love God as you should, make use of these means to know Him, and to have Him refresh that love with His sanctifying grace. Pay particular attention to the things that are read at Mass. Have a missal to read them at home on the days when you cannot attend in person. For example, look at today’s Epistle and Gospel. In the Epistle, Saint Paul tells us of the freedom that Christ has won for us at great price. And as he tells us elsewhere in the very same chapter of his Epistle to the Galatians, “God sent his Son, made of a woman ... that we might receive the adoption of sons” and daughters of God. God has made us not servants, but has made us welcome members of His own household. Virtually every time you read the texts, from virtually any Mass throughout the year, you will read about God’s love for you. If you say that you have difficulty in loving God because he is far away, you need only look around to find any number of people to love for the sake of loving God. 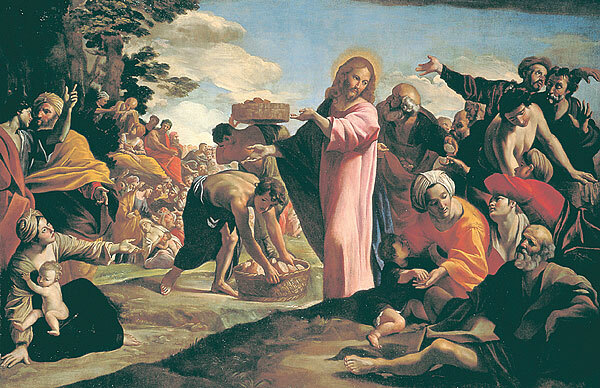 Quinquagesima Sunday Epistle http://www.rosarychurch.net/english/quinqua.html 1 Corinthians xiii: 1-13.